See our shelties who have been lovingly adopted into "forever homes" in 2019. See our shelties adopted in 2004, 2005, 2006, 2007, 2008, 2009, 2010, 2011, 2012, 2013, 2014, 2015, 2016, 2017, and 2018. Maci - Maci is an owner surrender due to her owners health situation. 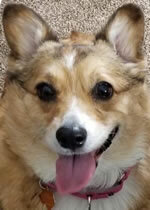 Maci is an 8 year old Corgi and a bit on the overweight side, she needs to lose about 15 pounds. Maci came in with Mack but is not bonded to Mack. She is up to date on all vaccinations, spayed, heartworm negative, and on heartworm preventive. She is currently on a low-cal diet along with good exercise, we know it won’t take long to get that weight off. Maci is house trained and crate trained. She tends to be a bit bossy so she is best with other dogs that don’t mind being told what to do. She is a fun little gal, quite a cutie. UPDATE: Kenzi has worked hard and passed her house training efforts. She is no longer having accidents in the house. Kenzi loves to dance; she dances, prances and spins and loves visiting new people and dogs. She seems to be rather non-committal about cats. Click on "More Shelties" above to see additional shelties available through Houston Sheltie Sanctuary. 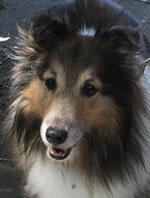 Click on "Referrals" to see additional shelties available through owner referrals. © 2019 Austin Sheltie Rescue. All rights reserved.